There are four types of agglomerating processes which have been developed (Fig 1). They are (i) briquetting, (ii) nodulizing, (iii) sintering, and (iv) pelletizing. Briquetting is the simplest and earliest applied process. Fine grained iron ores are pressed in to pillow shaped briquettes with the addition of some water or some other binder under high mechanical compressive pressure. In the nodulizing process, fines or concentrate along with carbonaceous material are passed through inclined rotary kiln heated by gas or oil. The temperature inside the kiln is sufficient to soften but not high enough to fuse the ore. The nodules vary considerably in composition and are too dense, slaggy, lack required porosity and hence this process could not find great favour. Briquetting and nodulizing are cold binding processes and mostly used for the recycling of recovered iron ore wastes in the steel plant. Sintering and pelletizing are the processes of major importance for the iron production. During 2014, as per World Steel Association, the production of blast furnace iron and direct reduced iron were 1183 million tons and 73 million tons respectively. Most of this production has come from iron ore in the form of sinter and pellet. While the preferred feedstock for blast furnace iron is sinter and/or pellets, that of direct reduced iron is pellets only. Though accurate production data for sinter and pellets are not compiled, but world production of sinter and pellets together can be safely estimated to be well over 1300 million tons per year to support the iron production of 1256 million tons. Historically, the feedstock for the world?s blast furnaces was naturally occurring lump ores. During the mining of iron ores, large amounts were getting generated. These fines since could not be used in blast furnace were being dumped. The depletion of deposits of higher quality lump ores forced the development of sintering of the generated fines in order to use them in the blast furnace. The depletion of deposits of higher quality lump ores also forced exploration of low-grade ores that required fine grinding for concentration. These micro fines of high-grade concentrates had to be agglomerated for their use in the blast furnace and this has led to the development of the pelletizing process. These agglomerates, in turn, sharply improved blast furnace performance and led to a major shift in blast furnace burdening. Middle of nineteenth century, small sintering pot used to be constructed in the copper mining in England. The origin of sintering process goes back to 1887 when F. Haberlein and T. Huntington of England invented the process of agglomeration for sintering of sulphide ores. In this process, the sintering was carried with the sintering bed being blown with air from bottom upwards. The process was also known as up-draft sintering process. The process was patented on 11th April 1905 (Patent no. 786814). The pot sintering methods used is shown in Fig 2. In 1902, W. Job invented the sintering of pyrite cinder and dusty iron ores with addition of coal and air blowing through the bed from bottom upwards (German patent number 137438). In 1905, EJ Savelsberg developed the process of iron ore sintering with the sintering mixture containing coal and coke breeze (German patent number 210742). In 1906, AS Dwight and RL Lloyd both of USA invented a belt type sinter machine for vacuum sintering. In 1909 Von Schlippenbch invented a rotary type of sintering machine (German patent number 226033). In 1913, W. Barth designed a sintering belt for operation with air blowing from bottom upwards (German patent 276424). In 1914, JE Greenawalt was granted a patent (US patent number 1103196) for rectangular tilting pans for vacuum sintering. The circular type of sintering machine was invented in 1930 by VA Sakharnov. The Huntington and Haberlein process was the best method of sintering prior to Dwight Lloyd patent number 882517 of 17th March, 1908. This process was capable of producing some sintered material, but the mass of product was unsatisfactory in composition and costly to handle. It was produced in great pots, in which tons of ore mixed with lime were burned under draft forced upward through the material. Under these conditions a uniform product could not be produced. The lower portion of the charge, owing to the pressure imposed by the weight of the superimposed material, were reduced to a nonporous slag, and while in the upper portions of the charge large quantities of fines remained unsintered, owing to the agitation of the ore particles, caused by the upward rushing currents of air. The unsintered material required re-treatment and the large masses of nonporous, thoroughly fused material could not be used in the blast furnace until broken up, at large expense, and even then were unsatisfactory, because of their physical and chemical structure. The clumsy pot roasting process of Huntington and Haberlein did not bear comparison with the process disclosed by Dwight Lloyd patent number 882,517.The process described in this patent eliminated the varying degrees of pressure throughout the mass, and maintained the ore particles in a state of quiescence during combustion. The means by which this was accomplished were simple, but effective. Pressures throughout the mass were avoided by treating the ore in a thin layer. Quiescence of the particles during combustion was attained, either by employing a down draft with ignition at the top surface, in which case the agitation of the particles was restrained by the vessel in which they were contained and the pressure of the downward draft, or, if an upward draft was used, by employing a screen to maintain the quiescence of the particles near the top surface. In porosity, friability, and chemical structure the sintered product of Dwight Lloyd was quite ideal for treatment in a blast furnace, and their process was superior to any method of the prior art for preparing fines ores for treatment in a blast furnace. The first operating machine according to this method was developed by Arthur Smith Dwight (1864 – 1946) and Richard Lewis Lloyd in June 1906 in the copper mine in Cananea built, Mexico and 1907 the corresponding patent. In 1908 Dwight Lloyd installed sintering apparatus at the plant of the Ohio Colorado Smelting Company at Salida, Colorado. This apparatus was a continuous type of machine, in which the bed of ore was constantly moved under an igniter and across section chambers, which maintained a down draft during the process of sintering. The sintered product was being automatically dumped by the machine after the material has been ignited, moved across the suction chamber, and sintered. Prior to 1910, JE Greenawalt, who was a metallurgist of considerable experience, was engaged in the study of processes for the desulphurization of sulphide ores. In the course of his work he found the use of a porous hearth, upon which the ore was roasted under a down draft of air, resulted in efficient desulphurization, and that the down draft could be utilized in saving volatile elements of value in the products of combustion, ordinarily carried off through the furnace stack. He had noted the sintering effect of this process upon the ores under treatment, but it was not his purpose to produce sinter, and in the development of roasting processes his effort was to prevent sintering, which impeded complete desulphurization. For this purpose, in his two down draft patents, Nos. 839,064 and 839,065 (December 18, 1906), he employed rabbles. Greenawalt developed an intermittent sintering apparatus based on downward draft which was installed at the Modern Smelting Refining Company, at Denver, Colorado around 1909. Greenawalt process was discovered by Greenawalt a few months ahead of Dwight Lloyd Process. The features of the process were very less air leakage and the bottom of the pot was made of grate or perforated steel plate. Feeding and ignition furnace was movable with sinter normally dropped due to rotation of pot above hopper. This machine consisted of a pan mounted upon trunnions, in which the material was sintered, downdraft being maintained by a suction chamber in the pan beneath the bed upon which the ore was sintered. The sintered product was dumped by turning the pan upon its trunnions, when it was recharged and the process was repeated. This process was installed for sintering blast furnace flue dust. It was first commercial sintering plant of Greenawalt process. Greenawalt patented this process and since 1910, his apparatus had been used extensively in the treatment of sulphide ores and since 1912 in the treatment of ferrous ores. Dwight Lloyd sintering process with down draft became popular and most of the sinter being produced these days is by this process. The two inventors, who founded in 1907 the “Dwight and Lloyd Metallurgical Company” in New York, not only built themselves a large number of these plants, but licensed the process world, among others at the plant manufacturer Lurgi. The first machine that sintered Dwight-Lloyd-process iron ore was built in 1910 in the United States. The first Dwight-Lloyd sintering plant in Germany was built in1917. Though a large numbers of improvements have been made since then in the machine mechanical design and in the process of iron ore sintering, still the basic principle of the process remains the same. Pelletizing differs from sintering in that a green unbaked pellet or ball is formed and then hardened by heating. During the development of the sintering process, initial attempts were in the direction of further improving the process for using micro fines ores. This has led to the development of a process which was an alternative to sintering. This process was named pelletizing process. In Sweden and Germany, use of major amounts of fines in the sinter mix led to limited productivity, and thus brought about the first phase of the development in the pelletizing process. The first patent on pelletizing was granted to AG Andersson of Sweden in 1912 (Patent number 35124) and in 1913 to CA Brackelsberg in Germany. A pilot pellet plant with 120 tons per day capacity was constructed in 1926 for Krupp at Rheinhausen Steel plant. This plant was dismantled in 1937 for making space to a large sinter plant. The second phase of development of pelletizing process took place in USA. The principal nursery of this technique and the source from which the flow of successful modern development has sprung is the Mines Experiment Station of the University of Minnesota, USA. During the 1940s research workers at this station under the direction of Dr. EW Davis and his associates examined the problems of utilizing the low grade iron ores of Minnesota. Particular attention was given to the ferruginous rocks adjacent to the main ore bodies of the Mesabi Range. These low-grade ores (25 % to 30 % Fe) are quite exceptionally hard and abrasive and are known locally as ?taconites?. These ores are the original material from which high grade Mesabi hematites have been evolved by natural leaching and oxidation. The recoverable iron mineral is finely disseminated magnetite and the ore must be ground to about 80 % of size – 325 mesh for liberation, the concentrate containing about 65 % iron and 8 % silica. By 1945 research and development at the Station had made considerable progress. Here not only had a promising concentration technique been evolved but novel ways had been investigated of using the very fine concentrate produced. The wet concentrate was balled in a rotating drum and then hardened by suitable heat treatment in a shaft kiln. The hard pellets (about 15 mm to 25 mm in diameter) were thought to be a suitable blast-furnace feed material and subsequent tests in a small experimental blast furnace were encouraging. These results attracted the attention of iron producers of the world and inspired some particularly energetic and successful work in Sweden. In the USA, the steel and ore companies saw in this technique a means of prolonging the rich but dwindling ore resources of Minnesota and Michigan by making available hitherto unusable material. New companies were formed to explore these possibilities, and research was intensified. By 1949, it was generally agreed in USA and in Sweden that the best way to prepare balls from a concentrate was in a rotating drum, but opinion was divided on the heat treatment method. It was essential that the apparatus used, whatever its form, should (i) give close temperature control, (ii) require the minimum amount of fuel, i.e. should recuperate sensible heat, (iii) have reasonably trouble-free and reliable in operation, and (iv) have an adequate unit output. At first, vertical ‘shaft kilns were used exclusively in pilot-plant research, moist balls of concentrate being fed into the top and moving downwards against an ascending flow of hot gases which first dried them, and then elevated their temperature to the hardening region. Hardened pellets were withdrawn from the bottom of the kiln. Davies work culminated in 1943 when experimental pellets were fired in a shaft furnace. After World War II, in 1947, a similar experimental unit was built in Sweden. In 1950s, it became evident that pelletizing is an economically feasible method of agglomerating fine grained concentrate. The first pelletizing plant was commissioned in Sweden where pellets were fired in shaft furnaces with capacities of 10 to 60 tons per day. Although the process is intrinsically simple, and therefore attractive, it proved in practice to have some awkward features. Amongst the difficulties which were most acute in the early 1950s are (i) the difficulty of securing even gas distribution, (ii) the difficulty of securing even stock descent, uniform pellet treatment and trouble free discharge of product, (iii) the difficulty of securing a high output from one unit, and (iv) uncertainty about ‘scaling-up’ and the most appropriate kiln shape. These problems caused the Reserve Mining Company in the USA to seek another way forward. The new line of advance had its genesis in the ‘Lepol kiln process’, used in the cement industry. This process, which was developed in Europe, consists of a balling unit feeding a moving grate on which the balls are dried and partly hardened. The grate discharges into a rotating kiln where the burning process is finished the hot gases from the kiln are ducted back to the grate where they perform the drying and hardening functions just mentioned. Mitchell has reported that Dr. Lellep of the Allis- Chalmers Company suggested that the balling drum and grate might well be used for producing burned pellets from fine magnetite concentrates. If such an arrangement could be designed to dry and fire the pellets and to recuperate the sensible heat of the product, it might well solve the problems of fine magnetite agglomeration relatively cheaply. Research was continued in the Allis-Chalmers laboratories with encouraging results, and in 1954 the Reserve Mining Company commissioned a 1 000 tons per day experimental machine based on these principles, but designed mechanically on sinter machine lines by the Arthur G. McKee Company. The pellets were dried by blowing hot air upwards through the bed, and then hardened by drawing hot gases downwards from special furnaces. Arrangements were made to cool these pellets on the strand and the hot air recovered was used to dry the wet balls at the feed end, thus reducing fuel consumption. Useful operating experience was obtained and after a few months trial the Reserve management placed orders (April 1954) for the design of six large machines to be installed at Silver Bay, on the western shores of Lake Superior. Other companies, however, persisted with the development of the vertical kiln process, again for magnetite concentrates, and their progress also justified the erection of some large installations: The Erie Mining Company plant at Hoyt Lakes, the largest of its kind, was commissioned in 1957 and includes 24 vertical shaft furnaces. In the 1950s, therefore, both vertical shaft kilns and moving grate machines were being developed and applied to the pelletizing of fine magnetite concentrates. Magnetite concentrates are relatively easy to pelletize. The particles are granular (rather than plate-like) in shape, with a high surface area, and with a surface uncontaminated by flotation agents. If properly treated they oxidize during firing, giving a useful heat release. Oxidation is also associated with grain growth and recrystallization which contribute to the development of the requisite final strength. However, not all ferrous concentrates are magnetites. In the state of Michigan there are large deposits of jaspilite in which the iron mineral is a finely divided specular hematite. These ores have been called the Michigan counterpart of the Minnesota taconites, but the iron mineral is recoverable by flotation and gravity methods, rather than by magnetic concentration. Such hematite concentrates present special problems and their exploitation has been a major concern of the Cleveland Cliffs Iron Company. In 1956 they began operation at Eagle Mills (Michigan) with a grate machine, but since then two very successful larger plants have been built using the grate-kiln system, this being, in fact, the Lepol process as a whole applied directly to the iron ore problem. The system has been developed by Allis-Chalmers and the plants themselves have been engineered and constructed by the McKee Company. In general it may be said that the Lepol process (drying and preheating on a grate and hardening in a kiln) has proved very successful with hematite concentrates (which do not have the advantage of an exothermic heat of oxidation) whilst for magnetites the ‘straight grate’ or vertical shafts are the usual tools. Pelletizing of iron ore is a method of Swedish origin, patented in 1912 by AG Andersson (Yamaguchi et al., 2010). The process was developed in the USA in the 1940s, and the first commercial plant started operation in Babbitt, Minnesota in 1952. The first iron ore pellet plant of the grate-kiln type was established at Humboldt Mine, Michigan in 1960. Allis-Chalmers (a predecessor company to Metso) have since built around 50 such plants. However, very few of the older plants built before 1975 are still in use. Another constructor of grate-kiln plants is Kobe Steel, who built their first plant in 1966 at Kobe Works, Nadahama, and have since then constructed more than ten plants, most of which are still in use. 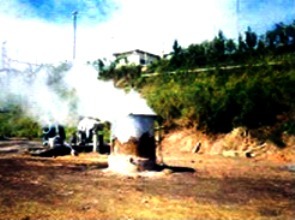 Since 2000, the grate-kiln process developed by the Shougang Group has been rapidly adopted in China. The establishment of new grate-kiln plants in China has been very prominent in the last decade, with the rise of new fabricators such as Jiangsu Hongda and Citic. There has been an exponential increase since 2000, driven mainly by installations in China.